Zumba for HEALS! - HEALS, Inc.
Did you know “Zumba” is Spanish slang meaning “to move fast and have fun?” Well, this Monday, September 30th from 6-8pm you can Zumba for HEALS and three other local non-profits! 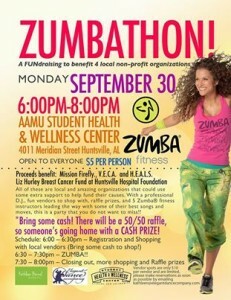 This “Zumbathon” is a FUNdraising event to benefit HEALS, Mission Firefly, S.A.V.E.C.A., and the Liz Hurley Breast Cancer Fund at the Huntsville Hospital Foundation. Held at the Alabama A&M University Student Health & Wellness center, it is open to everyone, and costs $5 a person. There will be a professional D.J. and five Zumba instructors to lead the way with the best songs and moves. To make this event complete, there will also be fun vendors for shopping and raffle prizes for winning! You can learn more and ask questions on the event’s facebook page. Hope to see you there moving fast & having fun supporting HEALS!